Direct descendant of the C43, the C44 project originates from the desire to offer an even more comprehensive and comfortable version. 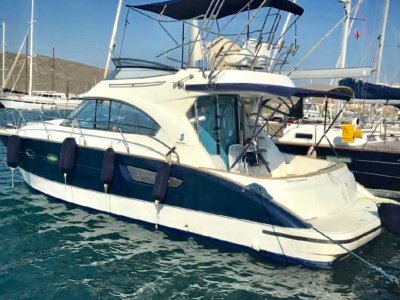 With 2 VOLVO PENTA IPS 500 or 600 engines, the C44 has the same hull as the C43, widely hailed by the specialized international press for its suppleness and sea keeping qualities when it was launched in 2008. A new feature is the hydraulic bathing deck with a 600kg capacity, for accommodating and launching a 2,3m tender. 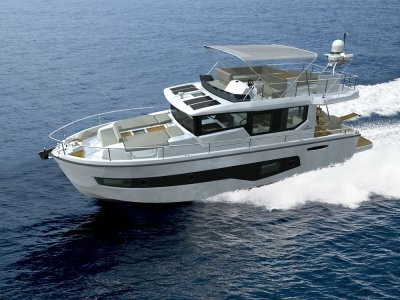 The cockpit layout is available in two different styles: simple version with deck lounge, large sun deck and tender garage at the rear or the double version with two sofas in a "U" shape and a table comfortably seating 12 guests. DECK: S/S bow roller - electric anchor winch - anchor and chain - anchor safety cable - S/S bow pulpit with teak step and fender holders - holding water tank drain outlet from shore - S/S bow, mid-ships and stern cleats and rope lead - foredeck sun pad with S/S handrails and glass-holders - double windshield wiper with washer. COCKPIT: Steps for bow access in teak - front and side glass windshield - sliding pilot side glass - Hard top with electric sliding sun roof and spot lights - Mast with: horn, navigation lights, anchor lights and flag holder - furniture with crystal top, S/S sink with mixer tab, teak cutting board shatter, 65 l fridge - courtesy lights - living area with bow and stern sofa - teak table with glass holder on bow sofa area - teak table with telescopic support on stern sofa area - pouff with storage underneath - side access to engine room - waterproof and anti-uV upholstery - sliding door for dinette access - stereo speakers. CONSOLE: three-dimensional dashboard in champagne colour with leather sunlid - compass - personalized and adjustable leather steering wheel - object holder - reversible pilot bench with S/S co-pilot handrail - engine instrument board complete with: analogue rpm indicator with digital display, oil pressure and temperature indicator, water temperature indicator, voltmeter, engine sound warning alarm, fuel level indicator, rudder indicator, back- lighted switch panel for deck services - GpS Chart plotter raymarine 125 - ipS joystick boat control system - Volvo penta electronic engine controls - hydraulic flaps Bennet - manual control for fire extinguishers with interception valves - radio CD remote control. DINETTE: access steps with courtesy lights - dinette sofa in chenille with storages - telescopic nut wooden table - cabinets with ivory lacquered shutters with electric panel and Sony radio CD - venetian wooden curtains - ivory lacquered kitchen with S/S work surface, 2 rings glass ceramic hob, S/S sink with mixer tap, bottle holder, kitchen cupboard with drawers, 100 l fridge and dedicate rubbish bin storage - cabinets with microwave oven and aluminium Venetian blind - opening S/S portholes - deck hatch - lights - wooden floor - power sockets - stereo loudspeakers - electric bilge pumps with manual/automatic actuation. BOW CABIN: Double bed with baggage storages underneath, mattresses, pillows, bed sheet cover, leather bed side and lateral bookshelves - fabric headboard - wardrobe - wooden nut cabinets and night tables - carpet floor - reading lights - spotlights - power sockets - opening portholes - deck hatch - direct access to bow toilet - venetian wooden curtains. wooden curtains - opening porthole - double entrance from bow cabin and dinette - power sockets - tight spotlights - - bathroom accessories. STERN CABIN: Double bed with storages underneath, mattresses, pillows, bed sheet cover, leather bed side and fabric headboard - wooden nut wardrobe - side cabinets in nut wood and leather - carpet floor - panoramic windows with S/S opening porthole - reading lights - spotlights - power sockets - venetian wooden curtains - exclusive access to stern toilet. STERN TOILET: Marine WC - bidet shower - shower with plexyglass door, teak floor, mixer tab and sliding diffuser - nut furniture with brown lacquered top, ceramic free standing sink and mixer tab - cabinets with mirror shutters - wooden floor - venetian wooden curtains - opening porthole - power sockets - tight spotlights - - bathroom accessories. HANGAR: electric opening door - housing for disappearing oildynamic passerelle - technical equipment storage - manual lift hangar floor. 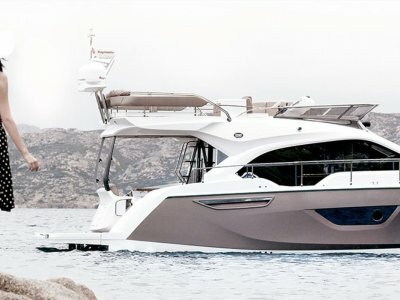 ENGINE ROOM: two for 480 l fuel tanks (each) - double fuel sender with eVC system - fuel tank balance system - interception valves - filters with separation water/fuel - hydraulic Flaps - fire extinguisher system with automatic and manual extinguishers -electric bilge pumps with manual/automatic actuation. HYDRAULIC SYSTEM:265 l water tank - nr. 1 water pump with filters - 20 l hot water system (electric 230V)- water distribution system directly at shore. HOLDING WATER SYSTEM: 95 l tank - discharge pump - tank discharge through exhauster system at shore - Wc fresh water flush. ELECTRIC SYSTEM: 4 batteries 110 ah / 12 V for ech engine - 4 batteries 100 ah / 12 V for services - nr. 01 battery 100 ah/12V for generator - automatic battery charger - 230 V shore power - emergency electric and manual battery switches - converter - 3,5 Kw generator - 24V electric system. At this price it is exceptional value. 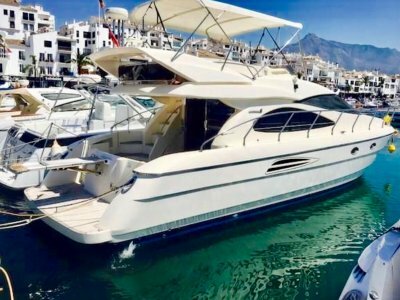 Contact Premier Yachting on 03 9592 4022 or 0411 277 824 for further information. The Premier Yachting group now has offices in most states. Call to find your local Sessa dealer.